Functional components for your printer systems. As a global leader in inkjet reservoir media, Porex creates a wide range of products for printing systems, including the highest ink release media on the market, plus options for ink wicks, free ink vents, and 3D printer filters and diffusers. As a global leader in inkjet printer media, Porex creates the materials with the highest capacities and ink release rates in customized shapes and sizes to meet your specific printer system’s needs. Deliver the highest release rate on the market – Customized HRM (High Release Media) materials release from 80% - 90% of your ink for maximum cost effectiveness and customer satisfaction. Absorb and deliver high ink capacity–Ink management components can be customized in various shapes and sizes based on your printer’s design needs. 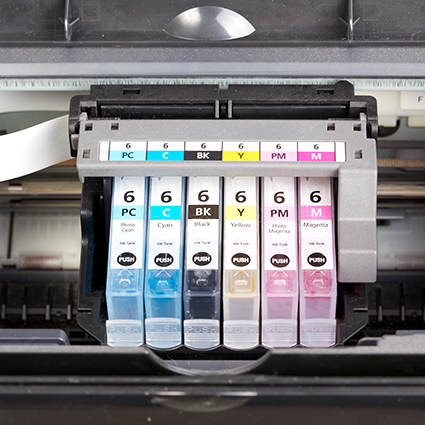 Precisely controlled ink delivery is critical for consistent ink flow within printers. Porex creates customized ink delivery wicks, vents and retention media that ensures the proper functionality in even the most complex printer systems. POREX® hydrophobic and oleophobic vents allow free ink systems to ventilate while repelling ink. Designed to meet your specific printer’s needs, our free ink vents can be directly welded onto the ink reservoir. The robust sintered POREX® Virtek™ PTFE structure can be handled and processed using standard assembly methods without compromising material structure or performance. Porex creates a wide variety of standard and custom solutions including diffusers, air & liquid filters, wicks, vents and absorptive media to meet your 3D printing needs. Specifically designed for 3D printers, our broad portfolio of porous media solutions can meet virtually any challenging application need.